PaisaWapas PayPal Cashback Offer:- As we are all aware that PayPal Zingoy Cashback Offer has been ended now. Now PayPal is not allowing any Virtual Cards on Zingoy to give 200 Rs Cashback Offer. So in this way you have been trying to restrain yourself to buy any Amazon Vouchers from Zingoy to get flat 50% Cashback from PayPal. Now PaisaWapas is here with PayPal 50% Instant Cashback Offer. Where you can Buy Amazon Vouchers and some other Vouchers to get Instant 50% Cashback up to 200 Rs in your PayPal account. If you are going to use PayPal Account as Payment Method. Interesting thing is that you can use "Virtual Cards" too, to get Cashback of 50% in your PayPal Account. Meesho Refer Earn:- How To Earn Sound Money using Your WhatsApp. 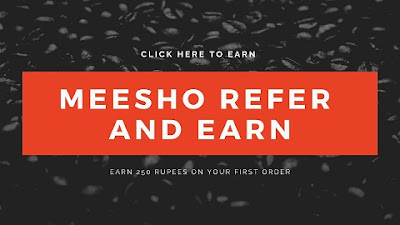 Currently, Meesho is one of the best app to give you the 250 Rupees on your Referral's First Order. To know more you can visit here:- Meesho Refer Earn Bank Cash. "PaisaWapas" is a website based on promo codes, deals, Cashback Offers. Where you can get some best offer to get Instant Cashback on your Purchases. PaisaWapas is also providing some "PaisaWapas Refer Earn Offer" where you can get some Referral Bonus too. You have to use "PaisaWapas Referral/Invite Code" to get the Referral amount. If you are eager to buy Gift Cards/ Vouchers of Amazon, BookMyShow, Flipkart etc. Then you can consider the PayPal PaisaWapas 50% Cashback Offer. Where PaisaWapas is offering these EGVs with the collaboration with PayPal 50% Cashback Offer. We know that PayPal is now not allowing any Virtual Cards as a PayMent Option to give the 200 Rs (50% Flat Cashback) on the purchases of Amazon Vouchers on Zingoy Platforms. But on the PaisaWapas Platforms, you can buy Amazon Vouchers with Virtual Cards too using PayPal Offer. How To Buy Amazon Vouchers From PaisaWapas? It is quite easy to buy Amazon Vouchers (EGVs) from PaisaWapas. As they have introduced the feature to buy Various Gift Vouchers from their site. They are also providing the WhatsApp Chat Support. However, you can follow the below steps to buy Vouchers. First of All, Go to the PaisaWapas and Click on Register. Now Enter the Referral Code - KZ76P and Apply it. You'll get Instant 30 Rs Cash in Your PaisaWapas Account. After this Enter Your Email & Click on Register. Enter Name, Password and Complete Your Sign-Up Process. How To Get 50% Cashback From PayPal - PaisaWapas Offer? After the Successful Sign Up on PaisaWapas with the Email. Now Click on the Banner of PayPal 50% Offer. That is flashing on the Homepage of PaisaWapas. Now Choose your Gift Cards Like Amazon of Flipkart. Choose the Denominations of your Gift Cards (Vouchers). Means the Value of the Gift Cards like 200,100, 400 etc. Now Enter the Name, Email & Number. Make sure you're using the Same Email that you have used while registering on PaisaWapas. After this, Click on Make PayMent option. Choose PayPal option in the next step, Click on Proceed. Here you can Enter Card Details, Use the Same Email of PaisaWapas to Register on PayPal & then Make your Payment. You'll get your Vouchers on the Email ID & you'll get Instant Cashback of 200 Rs in your PayPal Account. So using the PaisaWapas you can buy Amazon Vouchers worth 600 Rupees in just 400. You can consider other Vouchers too that are available on PaisaWapas. Use the PayPal PaisaWapas Cashback Offer to get Instant Cashback on your Gift Card purchases.